When looking for creamy, but nutritious cold soups, avocado is a likely candidate. When ripe, its texture stands true to its name - ‘butter fruit’. Loaded with good fats, fiber and potassium, but little sodium and no cholesterol, avocados are a part of sensible diet. Frankly, I was not a big fan of avocado until recent times. Although I love the texture, the taste was too bland. I used to avoid guacamole at all costs for this sole reason. But now I know the trick. I like my guacamole spicy; really spicy. Add an extra green chilli and another squirt of lime juice, voilà, the discovery of one of my refrigerator staples. Evidently, spicy guacamole is the inspiration for this soup. But beware, it is so darn addictive that this soup has become my indulgence these past few weeks. When prepared in advance, this makes for a good snack, anytime. This is ‘3’ in 1-in-3 – Cold Soups. 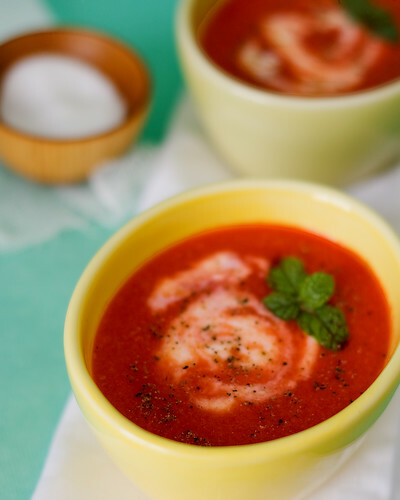 Check out Cold cucumber almond soup, and Super red tomato soup in this series. Scoop and dice the avocado flesh. In a saucepan, heat oil, lightly roast cumin seeds and sauté shallots, garlic and green chilli. When the shallots become transparent, add 1 cup of water with bouillon and bring to a boil. Switch off the stove, add avocado and fava beans to the pan. The fava beans will defrost in the residual heat, cooling the soup mixture simultaneously. Once cooled completely, transfer the contents of the pan to a blender along with coriander leaves and yogurt. Grind to a smooth mixture, check for seasoning and refrigerate for 30 minutes. Serve cold with a dollop of yogurt and shredded onions. 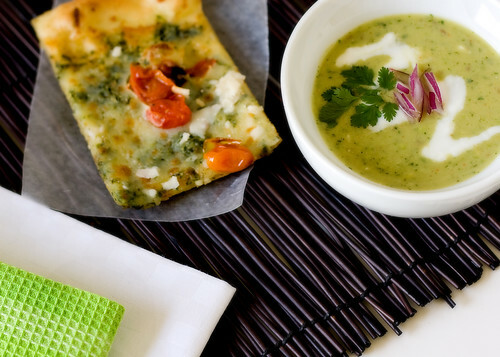 Cold avocado soup served with pesto flatbread. If you are looking for a quick fix, simply blend avocado with yogurt, coriander leaves, salt and red pepper flakes. Refrigerate and enjoy. This is my entry to Maheswari's AFAM. This month's edition, hosted by Archana of Archana's Kitchen, features avocado. To me, tomato is the epitome of summer. Bright, fresh and succulent, produce like this are a handful of things I look forward to in a dessert summer. Sliced, crushed, chopped, or stewed, its amazing how this fruit transforms a dish, nevertheless how its used. Almost all our repertoires have a recipe for tomato soup. I have one too. The issue I initially faced was the colour. However red the tomato was, after cooking and straining the colour fades a bit. Add a carrot for body, it becomes orangish. Not that its unattractive, but I was looking for the fiery red that I start with. If only I could get a food colour. And the answer was lying in my vegetable crisper – beetroot. You may have known this before, but it was a quite a find to me. Now I can make soup that looks as good as it tastes. In addition to adding the bright colour, beetroot also gives a faint earthy sweetness. But don’t go overboard, otherwise you will end up a purplish concoction. This soup, thickened with a roux, tastes great whether served hot or cold. 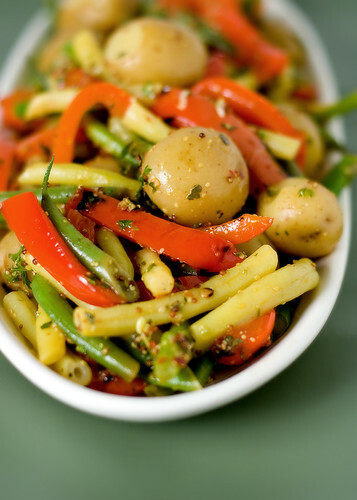 Serve with a salad for a light lunch or crusty bread/ crispy cracker for a light dinner. Take the ingredients listed above, from tomatoes through salt in a vessel and pressure cook until 2 whistles. Alternately, boil in a saucepan with ½ cup of water, for about 20 minutes or until the vegetables soft. Let cool. Fish out the bay leaf and cinnamon. Grind to a smooth paste and sieve. Don't use a sieve with fine holes, since we want the pulp to get through. Press hard and strain the juice and pulp, leaving only the skin and seeds of the tomato. Reserve the vegetable pulp. In a sauce pan, melt butter over low flame and add the flour. Mix the flour thoroughly in the fat and let it toast for a minute to change color. When the flour turns light brown and smells toasty, pour milk while simultaneously stirring the contents of the sauce pan. Make sure there are no lumps and let the milk heat up. The milk will gently bubble and thicken up slightly. When that happens, add the tomato pulp, and mix thoroughly. Continue heating over low-medium flame, adding water if necessary. When the soup almost reaches a boil, switch off. Check for seasoning and serve hot with freshly cracked pepper. Otherwise, cool completely on the counter and transfer to the refrigerator and cool for at least 30 minutes. Serve cold with a dollop of plain yogurt, if desired. 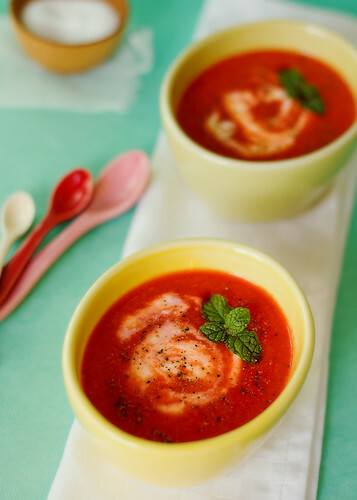 Velvety cream of tomato soup ‘2’ in 1-in-3 - Cold Soups. Savory, sweet, tart or hot, soups have something to offer everyone. Cold soups especially, seem to offer relief from this heat, even if temporary. The convenience that cold soup offers is endless. 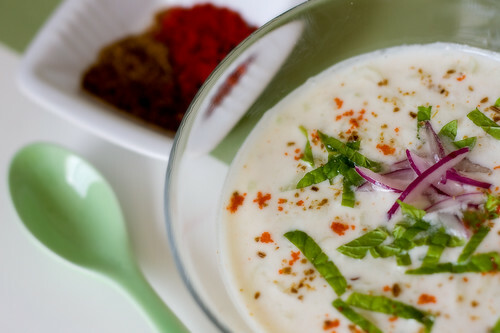 Most cold soups star a single fruit or vegetable, which attribute to their simplicity. They can be made ahead, and enjoyed without breaking a sweat, literally. With a little creativity, cold soups can be made with almost any fruit or vegetable. 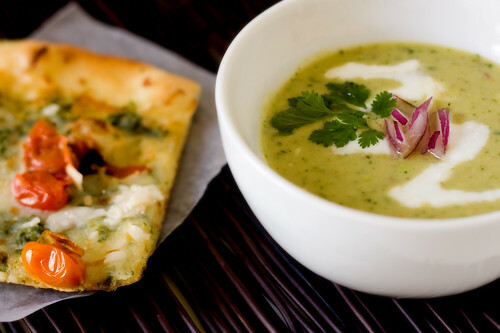 I usually add low-fat yogurt to give the soup body and texture, without adding ridiculous amount of calories. I also serve cold soups with a side of salad or sandwich, for a filling meal. Lets beat the heat with not one, but three refreshing cold soups, in 1-in-3 – Cold Soups. 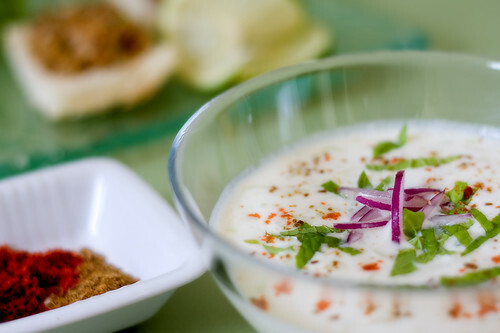 My inspiration for this soup is raita, an Indian condiment made with a vegetable and yogurt. 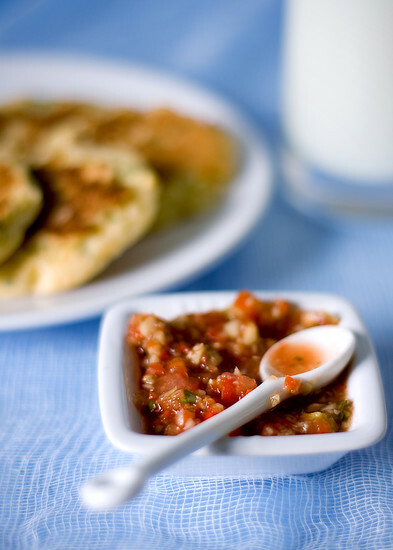 This cool condiment when served with a wicked hot curry, calms the palette. To give this cool soup an ‘oomph’, I have added almonds. Lightly sweet, rich and refreshing, this made for a perfect summer lunch, paired with almond pâté. Cumin seeds – 1 tsp, toasted and crushed coarsely. Take the grated cucumber in a big bowl. 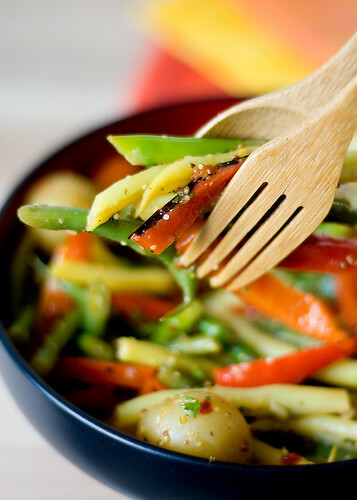 Grind almonds, green chilli and garlic, with ½ cup of water and add to the grated cucumber. To this, add yogurt, mint, salt and pepper. Mix thoroughly adding water if the soup is thick. Refrigerate for at least 30 minutes. Serve with a sprinkle of crushed cumin seeds and red chilli powder. Cold cucumber-almond soup served with almond pâté. If I have to name the favourite recipe of the year (so far, that is), then this would be it. I can’t remember how many times I have made this, but I still can’t get enough of this vegetable salad. Regardless of whether served as a side, or on its own, it tastes just great. It all started when I resolved that I was not venturous enough with respect to mustards. In the past, I slowly (read it ‘very slowly’) acquired a taste for Dijon mustard. A tsp or two in vinaigrettes, tarts, or cream sauces, is how got used to that funky flavour. When I was browsing the store shelves for a different kind, the whole grain kind caught my eyes. The yellow and brown seeds were, how to say, interesting. I was itching to make use of it, but wasn’t sure where to start. You cannot go wrong with a simple lemon vinaigrette, and that was where I started. Pure bliss, I should say. The crunchy texture was exactly what I was looking for. I made, and remade the dressing and improvised it to the level, that now I am totally satisfied. With a fridge brimming with produce, I used whatever I could lay my hands on and came up with this recipe. Feel free to use your favourite vegetables, but do try the dressing. Its my absolute favourite! Scrub and wash the potatoes. Cut away any black spots. Cut the bigger ones into half. Trim off the green and yellow beans where it attaches to the plant. Cut into 2 inch pieces. Similarly snap the asparagus where it turns woodsy, cut into 2 inch pieces. For a fancy look cut the beans and asparagus at an angle. In a large bowl, prepare the dressing by whisking all the ingredients mentioned above. Set aside. Heat 5 cups of water in a wide sauce pan. Bring to a brisk boil, and salt generously. Boil the potatoes for 10 minutes or until it is fork tender. Strain with a slotted spoon, and add to the dressing. To the same water, add the beans and let it blanch for 3 minutes. Add asparagus along with the beans and blanch for additional 3 minutes. Drain both and add to the potatoes and dressing. Core and quarter the bell peppers. If the sauce pan is wider, use it for searing bell peppers as well, like I always do. Otherwise, heat a skillet over high flame, spray with olive oil, and sear the peppers on high heat for about 3 minutes. Once they have blistered spots, sprinkle some salt, remove and let cool. When they are cool enough to handle, cut into ¼ inch wide strips and add to the salad bowl. Quarter the tomatoes, remove the seeds as they make the salad watery. 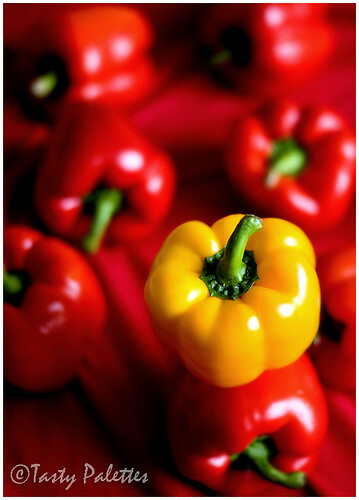 Cut them as thick as bell peppers and add to the rest of the ingredients. Toss everything together until the dressing is evenly coated. The salad tastes great warm or at room temperature. Serve with soup, quiche, or even pizza. Goes well with almost anything. Or make a light meal by serving with a chunk of crusty bread. This bowl that screams summer, goes to Sia of Monsoon Spice who is hosting WBB–Summer Feast. WBB is Nandita’s brainchild. Edited to Add: I am also sending this to Healthy Cooking, hosted by Mansi, Fun and Food. Ever since I saw this post at Susan’s blog, it got stuck to my head. Luscious, decadent, and chocolaty; the only way to get this custard off my head was to try making it at least once. Having all the ingredients on hand didn’t help either. I succumbed to temptation and treated myself with this fabulous dessert. Lavender blossoms were lost in the dark corners of my pantry for a few months now. Though I enthusiastically bought some, I was hesitant to cook with it for reasons unknown. I didn’t come across a recipe that compelled me to conquer my hesitation, until I stumbled upon this recipe. I duly followed the recipe to the T, waited patiently and dug my spoon into the smooth custard. The first mouth was totally unexpected. I have never tasted anything with such strong floral notes. Chocolate and lavender are quite a duo. I halved the recipe and made 4 portions from it, but this was still enough to treat our taste buds. Few things to be kept in mind are, don’t boil the cream along with lavender. It can turn bitter. Also, while straining, be careful not to over-strain the flowers. This may lead to bitterness too. Heat cream in a sauce pan just before it reaches a simmer. Remove from heat and add lavender blossoms. Set aside for 10 minutes, strain out the blossoms completely. Transfer back to the sauce pan, cover and refrigerate for an hour. This helps the flavours to develop. Preheat oven to 325 F. Put the sauce pan back on medium-low heat, add the chopped chocolate, and stir to melt. Continue to stir until the chocolate has dissolved completely. Remove from heat. Whisk the yolks and sugar in a bowl until thick and creamy. Slowly pour the chocolate-cream mixture into the egg mixture with one hand, while whisking the egg mixture with the other hand, simultaneously. Take care that the eggs don’t get curdled due to the addition of the hot cream mixture. Strain once again. Line a baking dish (about 9x9) with a clean kitchen towel. Place 4 ramekins without touching each other. 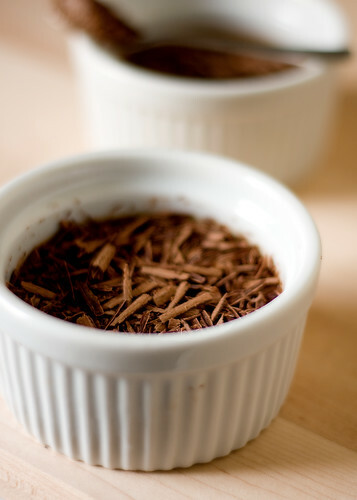 Evenly distribute the chocolate mixture among the ramekins. Pour hot water into the baking dish until it reaches halfway up the sides of the ramekins. Carefully slide into oven and bake for 20 minutes. The custard should still be wiggly when pulled out of the oven. 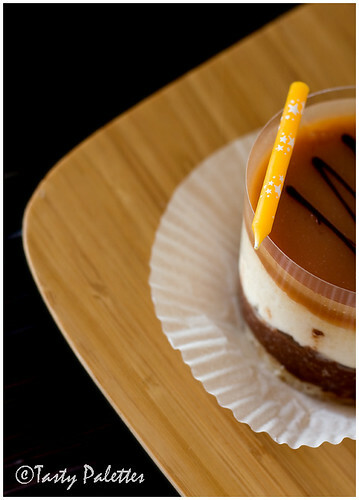 Take out of the oven, cool completely, and refrigerate overnight, covering the ramekins with plastic wrap. 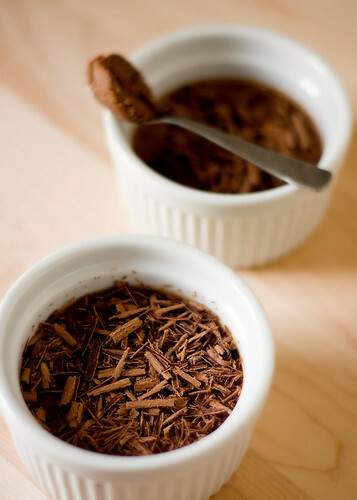 Serve cold with chocolate shavings or whipped cream. I didn’t even bother to whip the topping. Chocolate shavings were just enough for this delightful custard. Thank you, Susan. You are truly a Well-Seasoned Cook. An amazing dessert like this has only five ingredients. Less is More, Or so says Nupur of One Hot Stove. This is my entry to this month’s MBP. Rachna at Soul Food is hosting JFI. This month’s theme is Flower Power. I can’t wait to see what the bloggers have come up with. Rachna, I am sending this to you as well. Sift flour, baking powder and salt together. Add cornmeal, corn kernels and stir in milk and cilantro until just combined. Add more milk if the batter is too dry. Heat a griddle and spray with olive oil. 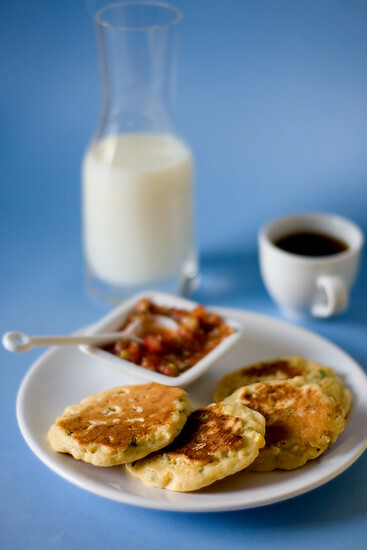 Pour batter to make small pancakes , about 2 inches wide (or more if you like). Wait till one side gets browned, flip and cook the other side. Serve hot with salsa. Take all the ingredients in a blender and blend till it resembles a chunky sauce. 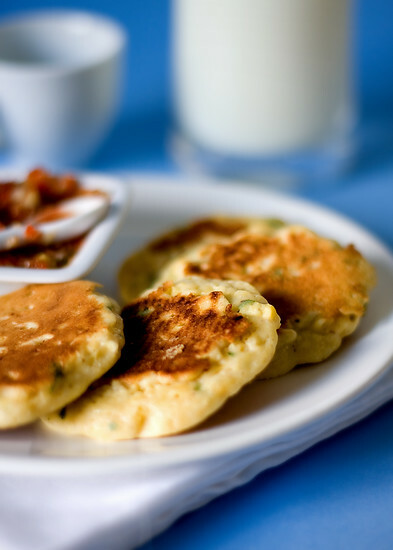 Check seasoning and serve with corn pancakes. This is my entry for Pancakes on Parade, a one-off event hosted by The Well-Seasoned Cook, Susan. My entry ‘Stand Out and Live-Strong’ has won the ‘Click Spectra’ – first place, in addition to winning the ‘Most Original’. I should say I am delighted by this win, but even more to see that this fundraiser is a success, thanks to your generous contributions. Bri, I send you strength and endurance through my prayers. Of course, I cannot conclude without mentioning the mighty efforts by Jai and Bee at Jugalbandi, for organizing this mammoth task. I applaud you both for your thoughtfulness. Judges, thank you for selecting my entry as the winner. It made my day. Here it is, the roundup of AFAM – Coconut. I knew this fruit is quite popular, but your response was truly overwhelming. Soon after I announced the theme, coconut-y creations from around the world started pouring in, not limited by cuisine or course, just what I was expecting. We have a total of 105 entries, with 2 or even 3 entries from some bloggers. I thank each one of you for your support and enthusiasm, which made hosting this event quite a fun. The entries are categorized into various heads for easy reference. They are further arranged in the order in which I received ‘em. The event logo on the left plane will bring you to this page for future reference. Visit the gallery to feast with your eyes. Last, but definitely not least, a big thanks to Maheswari of Beyond The Usual, for conceiving such a brilliant idea and allowing other bloggers, including me, to have the pleasure of hosting this event. Apart from recipes, here are a few interesting articles about coconut. Arundathi, of My Food Blog, describes making coconut milk at home. Priya, of Live To Cook, has written a series on coconut. In her wonderful articles, she explains how to break and shred a coconut, extract milk and freeze for later use. The article on how coconut is intertwined with the traditional roots of the Indian culture is a good read. That’s that. 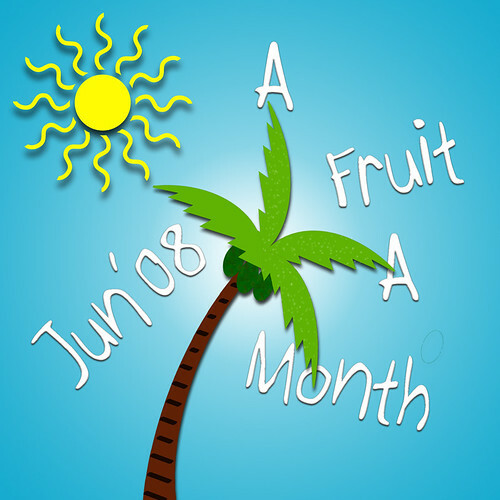 Now heat your pots and pans, and enjoy these delicious creations, featuring the fruit of the month – Coconut. I apologize for errors or omissions, if any, in the roundup. Please write to me to correct them. Thank you! I can have my cake and eat it too. Heck, its my birthday! My entry to Click - Yellow for Bri. Thank you all for your generosity and kindness.